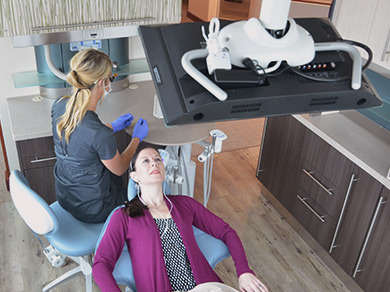 Our Chattanooga dentist office prides itself on creating a comfortable and relaxing environment. We take a series of measures to alleviate the stress and discomfort often associated with the dentist. While in our office, take in the scenic views of Chattanooga and enjoy fresh coffee and baked goods. Our exam chairs come complete with entertainment modules featuring Netflix, YouTube and Pandora. We also have blankets and headphones for your comfort. After procedures we offer gel compression masks to help reduce pain as well as OraVerse, which helps to reduce the numbness of anesthesia. Historically, numbing the mouth required injecting solutions through needles, but Kovanaze Nasal Anesthetic now allows us to apply a series of sprays into the nasal cavity before a planned dental procedure. The patient experiences the sensation of a light mist of water, the teeth becoming numb without any temporary paralysis of the lips common with injectable anesthesia techniques. This achieves an entirely new level of comfort during dental care. We hope you will take comfort in knowing you are in a relaxing environment and good hands at Alani Dental Center.